Cupid's Garden; The Bitter Withy; Henry My Son; The Drowned Lover; The Gown of Green; Death and the Lady; The Poor Old Couple; The Seeds of Love; Searching for Young Lambs; The Poachers' Fate; Peggy Benn; Green Upon the Green; Six Dukes Went a-Fishing; The Storms are on the Ocean; Henry the Poacher; No Sir, No; Sweet Belinda; Up in the North; The Royal George; John Barleycorn; The Wild Rover. Now this is what the world needs more of! 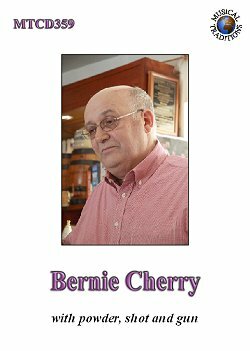 Bernie Cherry is a product of the folk revival, not the folk tradition, but you would never guess it to listen to him. In fact, on this recording, he sounds as though he could have stepped straight out of the grooves of a BBC archive disc. Moreover, his CD is composed almost entirely of English songs, which have themselves been learned almost entirely from the masters of the English tradition, and they’re sung for the most part without accompaniment. But please don’t concoct any visions of a slavish imitator of earlier generations – coughs and wheezes and all. The singing here is fresh and vigorous and very pleasing to the ear. Furthermore, despite the list of sources reading like a who’s who of the English tradition, you’d be hard pushed to identify any specific influences. As a single instance, just listen to the way he transforms The Wild Rover. It sounds individual and authentic, and I’d defy anyone to deduce on stylistic evidence alone that he learned it from Sam Larner. Five of the CD’s tracks are graced with tasteful and unobtrusive melodeon accompaniment. Four of these are from Roger Grimes and one is from Rod Stradling. Both musicians bring a high degree of expertise to their art, adding subtly to the impact of the singing without in any way dominating it. English folk music has undergone a remarkable transformation in recent years, with many of its younger practitioners taking it in fascinating directions, which we of the older generation could scarcely have imagined. Yet for a folk revival to remain a folk revival, it has to keep in contact with its roots. With that thought in mind, I strongly recommend this CD to everyone who has even a passing interest in genuine English folk song.